German Quake 2 scene in 1999 is explored, starting with the Voodoo People LAN Party, held at at VP-Nightmare’s house in Fürth, July 16 – 18, 1999. Then we look at the Hude LAN Party and the GXP LAN Party, in Hagen. That was Europe’s largest LAN party in 1999. Thank you to MFG-Rush for the excellent PC Games CD Rom and Mag review of the GXP LAN. Thank you to lanparty.de for producing the Hude LAN Party segments. 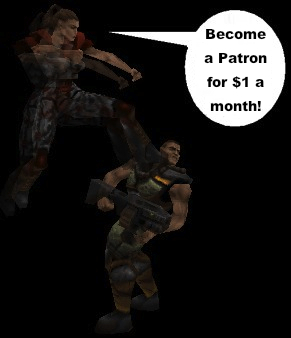 And the biggest thank you to Nightmare for his amazing archive of the Voodoo People Quake 2 clan.